The abstract of military service for Fred White (1898-1919). 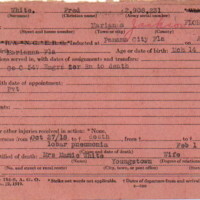 The card includes White's name, date and place of birth, units and ranks, death date and place, and who was notified of his death. Originally created and published by the General Adjutant's Office. General Adjutant's Office. 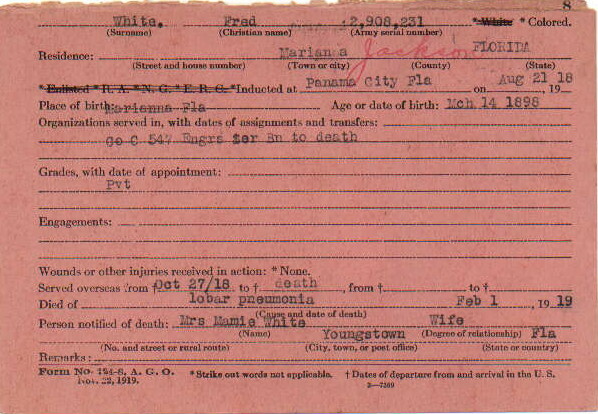 “Abstract of Military Service for Fred White.” RICHES of Central Florida accessed April 22, 2019, https://richesmi.cah.ucf.edu/omeka/items/show/10379.